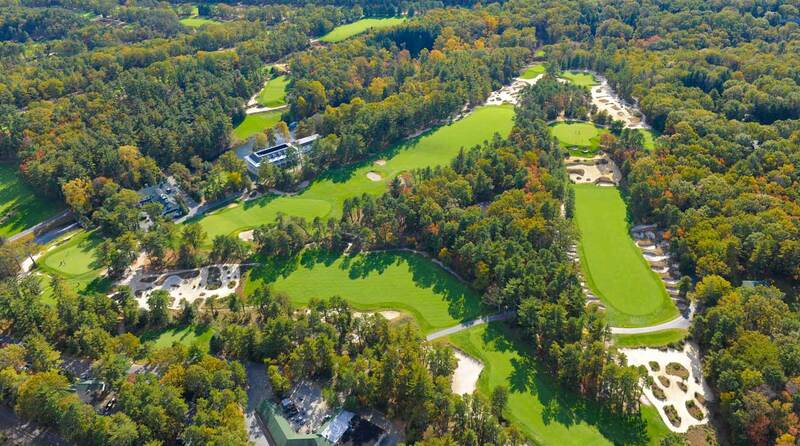 Pine Valley has long been ranked among the top golf courses in existence. In GOLF's 2017-18 ranking of the Top 100 Courses in the World, it took the No. 1 spot, beating out courses like Pebble Beach and St. Andrews. But you can get on Pebble and St. Andrews any day with the right timing (or bank account). Not so with Pine Valley. Except for this Sunday, that is. Pine Valley is not only one of the best tracks on earth, it's also arguably the most exclusive. Only members and their guests can play the iconic 18, and acquiring a membership card is nearly impossible. But every year the club opens its gates for a prestigious amateur tournament, the Crump Cup. Top amateurs from the U.S. and UK have long competed in the event, named after course designer George C. Crump. In fact, this week will see the 94th edition of the tournament. The format consists of 36 holes of stroke play, followed by four rounds of match play. A view of Pine Valley from the air. But the most special part of the week (and the only one of concern to you, dear reader) are the semi-final and championship matches on Sunday, Sept. 16. Why? Because the prestigious club allows the general public to walk the grounds and witness the final matches. If you want to go, all you need to do is pay for a parking pass in a nearby lot, where you will then be bused to the course. This is the only day each year where the vast majority of us can step foot on the grounds, so it's well worth the trip. Who knows, maybe while you're there you can hob-nob with some members and get invited to play a round.